She has experienced nothing but advantage from her gender. Toynbee’s case is worth hearing out, but it’s an instant classic of the worst British trait: resentment of others’ success. No culture I know of is more brutally unkind to its public figures, hateful toward anyone with a degree of success or money, or more willing to ascribe an individual’s achievements to something other than their own ability. The Britain I grew up with was, in this specific sense, profoundly leftist in the worst sense. It was cheap and greedy and yet hostile to anyone with initiative, self-esteem, and the ability to make money. The clip below captures the left-liberal sentiment of the time perfectly. Yes: the British left would prefer to keep everyone poorer if it meant preventing a few getting richer. And the massively powerful trade union movement worked every day to ensure that mediocrity was protected, individual achievement erased, and that all decisions were made collectively, i.e. with their veto. And so – to take the archetypal example – Britain’s coal-workers fought to make sure they could work unprofitable mines for years of literally lung-destroying existence and to pass it on to their sons for yet another generation of black lung. This “right to work” was actually paid for by anyone able to make a living in a country where socialism had effectively choked off all viable avenues for prosperity. And if you suggested that the coal industry needed to be shut down in large part or reshaped into something commercial, you were called, of course, a class warrior, a snob, a Tory fascist, etc. So hard-working Brits trying to make a middle class living were taxed dry to keep the life-spans of powerful mine-workers short. To put it bluntly: The Britain I grew up in was insane. The government owned almost all major manufacturing, from coal to steel to automobiles. Owned. It employed almost every doctor and owned almost every hospital. Almost every university and elementary and high school was government-run. And in the 1970s, you could not help but realize as a young Brit, that you were living in a decaying museum – some horrifying mixture of Eastern European grimness surrounded by the sculptured bric-a-brac of statues and buildings and edifices that spoke of an empire on which the sun had once never set. Now, in contrast, we lived on the dark side of the moon and it was made up of damp, slowly degrading concrete. I owe my entire political obsession to the one person in British politics who refused to accept this state of affairs. You can read elsewhere the weighing of her legacy – but she definitively ended a truly poisonous, envious, inert period in Britain’s history. She divided the country deeply – and still does. She divided her opponents even more deeply, which was how she kept winning elections. 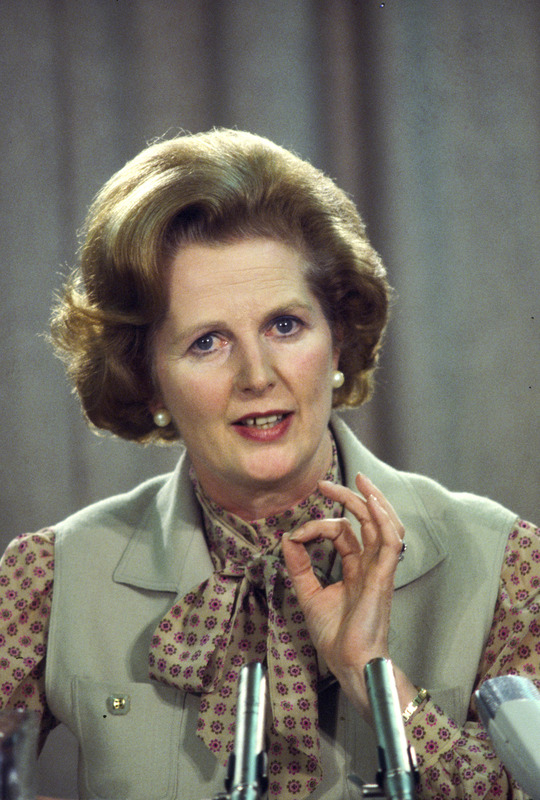 She made some serious mistakes – the poll tax, opposition to German unification, insisting that Nelson Mandela was a terrorist – but few doubt she altered her country permanently, re-establishing the core basics of a free society and a free economy that Britain had intellectually bequeathed to the world and yet somehow lost in its own class-ridden, envy-choked socialist detour to immiseration. I was a teenage Thatcherite, an uber-politics nerd who loved her for her utter lack of apology for who she was. I sensed in her, as others did, a final rebuke to the collectivist, egalitarian oppression of the individual produced by socialism and the stultifying privileges and caste identities of the class system. And part of that identity – the part no one ever truly gave her credit for – was her gender. She came from a small grocer’s shop in a northern town and went on to educate herself in chemistry at Oxford, and then law. To put it mildly, those were not traditional decisions for a young woman with few means in the 1950s. She married a smart businessman, reared two children and forged a political career from scratch in the most male-dominated institution imaginable: the Tory party. She relished this individualist feminism and wielded it – coining a new and very transitive verb, handbagging, to describe her evisceration of ill-prepared ministers or clueless interviewers. Perhaps in Toynbee’s defense, Thatcher was not a feminist in the left-liberal sense: she never truly reflected on her pioneering role as a female leader; she never appointed a single other woman to her cabinet over eleven years; she was contemptuous toward identity politics; and the only tears she ever deployed (unlike Hillary Clinton) were as she departed from office, ousted by an internal coup, undefeated in any election she had ever run in as party leader. Indira Gandhi and Golda Meir preceded her; but Thatcher’s three election victories, the longest prime ministership since the 1820s, her alliance with the US in defeating the Soviet Union, and her liberation of the British economy place her above their achievements. What inspires me still is the thought of a young woman in a chemistry lab at Oxford daring to believe that she could one day be prime minister – and not just any prime minister, but the defining public figure in British post-war political history. That took vision and self-confidence of a quite extraordinary degree. It was infectious. And it made Thatcher and Thatcherism a much more complicated thing than many analyses contain. And that was why she ultimately failed, as every politician always ultimately does. She wanted to return Britain to the tradition of her thrifty, traditional father; instead she turned it into a country for the likes of her son, a wayward, money-making opportunist. The ripple effect of new money, a new middle class, a new individualism meant that Blair’s re-branded Britain – cool Britannia, with its rave subculture, its fashionistas, its new cuisine, its gay explosion, its street-art, its pop music – was in fact something Blair inherited from Thatcher. She was, in that sense, a liberator. She didn’t constantly (or even ever) argue for women’s equality; she just lived it. She didn’t just usher in greater economic freedom; she unwittingly brought with it cultural transformation – because there is nothing more culturally disruptive than individualism and capitalism. Her 1940s values never re-took: the Brits engaged in spending and borrowing binges long after she had left the scene, and what last vestiges of prudery were left in the dust. Perhaps in future years, her legacy might be better seen as a last, sane defense of the nation-state as the least worst political unit in human civilization. Her deep suspicion of the European project was rooted in memories of the Blitz, but it was also prescient and wise. Without her, it is doubtful the British would have kept their currency and their independence. They would have German financiers going over the budget in Whitehall by now, as they are in Greece and Portugal and Cyprus. She did not therefore only resuscitate economic freedom in Britain, she kept Britain itself free as an independent nation. Neither achievement was inevitable; in fact, each was a function of a single woman’s will-power. To have achieved both makes her easily the greatest 20th century prime minister after Churchill. He saved Britain from darkness; she finally saw the lights come back on. And like Churchill, it’s hard to imagine any other figure quite having the character, the will-power and the grit to have pulled it off.